No, this isn’t a set from Tim Burton’s next Alice in Wonderland film. (If those films had sets.) Rather, it’s part of the 191st St. Tunnel, which the New York City Department of Transportation just unveiled. 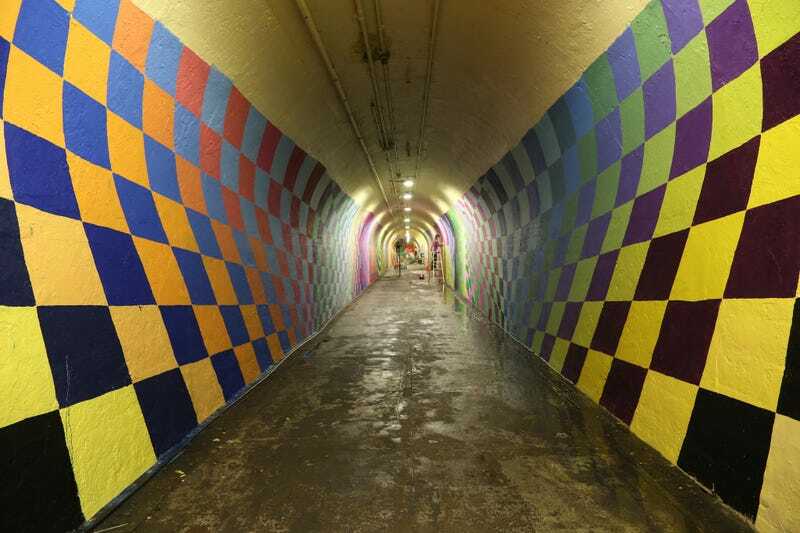 The New York City Department of Transportation’s Art Program recently produced, “The 191st Street Tunnel Beautification Project,” at 191st Street and Broadway in Manhattan. Local Washington Heights artist Andrea Von Bujdoss (Queen Andrea), who specializes in typography, Fernando Carlo, Jr. (COPE 2), a recognized graffiti artist within the community, Nick Kuzsyk, a geometric design specialist, Nelson Rivas (Cekis), a Chilean-born muralist, and Jessie Unterhalter and Katey Truhn, Maryland-based public artists, were selected from a pool of 158 applications, to each paint two, 200 foot long wall segments within the pedestrian Tunnel. The five murals add bright color and unique design to the 900 foot long space, which was formerly covered in graffiti tags and bland tan paint. Over the course of a week, each artist has left his or her mark within Washington Heights, aiming to create a safer and more beautified passageway for the thousands of pedestrians walking through it on a daily basis to access the 1 subway line.